St. Peter’s Dome is a remote but geologically fascinating area that I’ve tried to visit before. This time, I was determined not to be deterred by bad roads. St. Peter’s Dome is one of the San Miguel Mountains, a cluster of small peaks just west of Bandelier National Monument. The San Miguel Mountains are a volcanic center of the Paliza Canyon Formation, which erupted about 8 million years ago and crops out throughout the southern Jemez Mountains. Cindy was out of town this weekend, so I began my day taking Michael in to school. After dropping him off at Los Alamos High School, I headed south across Los Alamos Canyon and along the foothills of the Sierra de los Valles west of Los Alamos to State Road 4, then east to the entrance to Bandelier National Monument. From there, I drove south to the Frijoles Canyon Overlook. This gives a beautiful view of Frijoles Canyon and the San Miguel Mountains beyond. Frijoles Canyon is one of the largest canyons cutting through the Pajarito Plateau, with headwaters high in the Sierra de los Valles. It was the ancient home of a Native American community who were among the ancestors of today’s Pueblo tribes. There is a permanent river in the canyon (Frijoles River) that provided irrigation water for the ancient inhabitants, among whose staple crops were beans; frijoles in Spanish. The canyon cuts through the Tsherige Member, Bandelier Formation. This is known in older writings as the Upper Bandelier Tuff. It was emplaced during a supereruption of the Jemez Volcanic Field 1.25 million years ago which also produced the Valles Caldera. The Tsherige Member consists of a thin layer of pumice, the Tsankawi Pumice, overlain by several thick units of pyroclastic tuff. You can see several layers in the Tsherige Member across the canyon. These are cooling units, representing deposits that had just enough time to cool slightly before the next layer was deposited. The entire eruption is thought to have lasted only a few weeks. The Tsherige Member records only the most recent supereruption in the Jemez. It was preceded by the Toledo Eruption, 1.65 million years ago, which was probably similar in magnitude and took place from about the same location. It produced the Otowi Member of the Bandelier Formation, which is found beneath the Tsherige Member in many places in the Pajarito Plateau and is prominent in the Jemez Plateau. There are outcroppings of Otowi Member at the base of the cliffs at the entrance to the Frijoles Narrows, visible in the center of the last frame of the panorama. There are several prominent features on the skyline. In the first frame, Sandia Crest east of Albuquerque is prominent. This is a block of crust thrown up on the east side of the Rio Grande Rift, which runs north to south through the center of New Mexico. Tectonic forces are pulling apart the western United States, and the Rio Grande Rift is an area where the crust is being pulled apart particularly strongly. The Jemez Mountains sit on the west side of the Rift where it intersects a deep and somewhat mysterious feature in the crust called the Jemez Lineament. The Lineament may be the boundary where two ancient crustal plates were joined together 1.6 billion years ago, when North America was being assembled from smaller bits of crust. It is thought that the Rift has opened fissures deep into the crust through which large volumes of magma generated in the Jemez Lineament is able to reach the surface. The San Miguel Mountains are visible in the second and third frame. I’ll show a closer panorama in a moment. The fourth frame shows the Sierra de los Valles on the skyline. Cerro Grande is to the left, with Pajarito Mountain in the center and a jumble of smaller peaks to the right. Here’s a close panorama of the San Miguel Mountains. Notice the escarpment at the base of the mountains. This is the Pajarito Escarpment, which marks the location of a major fault. This is part of the Pajarito Fault Zone which runs along the eastern face of the Sierra de los Valles further north. 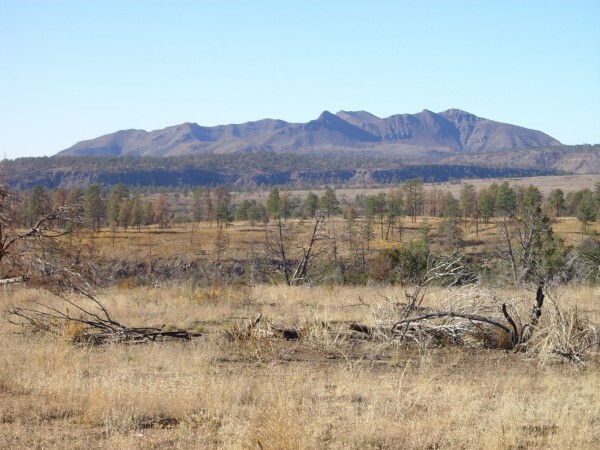 The Pajarito Fault Zone is very ancient, at least thirty million years old, and it became very active during the rifting that formed the Rio Grande Rift. It is probably no coincidence that the San Miguel volcanic center is located nearly on the fault, which has dropped the eastern side of the volcanic center to expose a cross section of the volcano. Alas, this is heavily eroded and it is not easy to pick out the various formations at this distance. Fortunately, I’m going to get a lot closer today. A few features do stand out. Near the center of the first frame are pink cliffs of what looks like more Bandelier Tuff. However, the geological map shows that this is actually a far more ancient tuff, the “pink tuff” of the Canovas Canyon Rhyolite that is found in many places in the southern Jemez and formed just before the bulk of the Paliza Canyon Formation. At the center of the second frame is St Peter;s Dome itself. There is an old ranger station at the summit that is just visible in the full resolution image. The sharp peak to the right of the second frame is Boundary Peak, so called because it is located almost exactly on the boundary between National Forest land to the west and Bandelier National Monument to the east. Peeking out between the hills in the third frame is a part of Peralta Ridge, one of the most prominent remnants of the Paliza Canyon Formation of which the San Miguel Mountains are the easternmost remnant. The small conical hill right of center in the third frame is Rabbit Hill, a dome underlain by Bearhead Rhyolite. The Bearhead Rhyolite is a high-silica formation that was erupted through the lower-silica Paliza Canyon Formation about 6 to 7 million years ago. This rock is similar to the rock of the Bandelier Tuff, but there is no evidence its eruption was accompanied by the formation of any giant caldera. 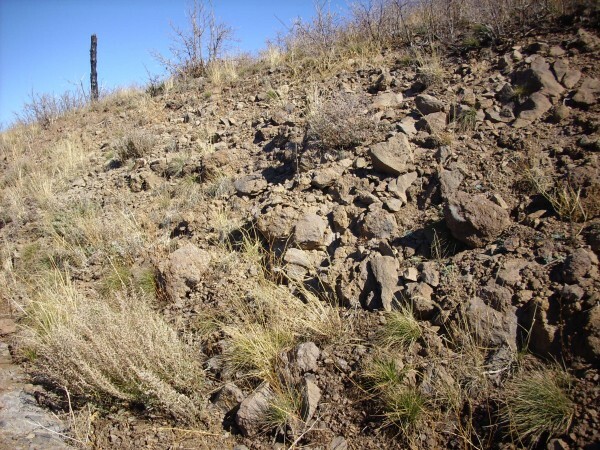 Geologists speculate that the Bearhead Rhyolite was not erupted in a supereruption because the Rio Grande Rift was still very active 5-6 million years ago, and the constant faulting allowed the Bearhead Rhyolite to erupt in a series of smaller, less violent eruptions. From here I proceeded back west on State Road 4. Along the way, there is an excellent view of the San Miguel Mountains from the northeast. Here I’ll borrow a picture from an earlier trip. From this angle, Boundary Peak is prominent at the center, with St. Peter’s Dome just beyond to the right. The north slopes west of Boundary Peak show bedding dipping to the east, which is not necessarily the original bedding angle; movement in the Pajarito Fault Zone may well have tipped the beds to the east from their original orientation. The beds are so well exposed here because the entire north face of the mountains broke off in a landslide sometime in the last few hundred thousand years. Landslide debris covers the area to the north and northeast of the San Miguel Mountains. The Pajarito Escarpment is quite obvious as one approaches it along State Road 4. You can see that the highway winds up the face of the escarpment. Looking north and south from one of the hairpin turns in the road, we get an excellent view of the Pajarito Escarpment in both directions. Note that there is a smaller escarpment east of the main escarpment to the south. This is a second strand of the Pajarito Fault. 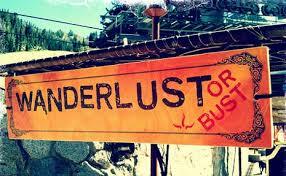 According to the geologic map, the road cut along the highway here is Tsherige Member, Bandelier Tuff. However, it is darker and more dense than any Bandelier Tuff I have seen before, and I wondered if this was possibly Tschicoma Formation exposed by the road cut. Probably not; it’s Bandelier Tuff erupted so close to the vent that it was very hot when deposited, and from so late in the eruption that it was unusually rich in iron and magnesium minerals. Here’s a sample. Had I run across this without knowing what it was, I would have taken it for an unusually quartz-rich andesite. From here I proceeded into the Jemez, turning south on Forest Road 289 (the Dome Road) and proceeding past Graduation Flats. Graduation Flats is a popular group camping site. It is also, according to legend, the site of the celebratory bacchanalia following graduation ceremonies from Los Alamos High School. Note the numerous burned trees. 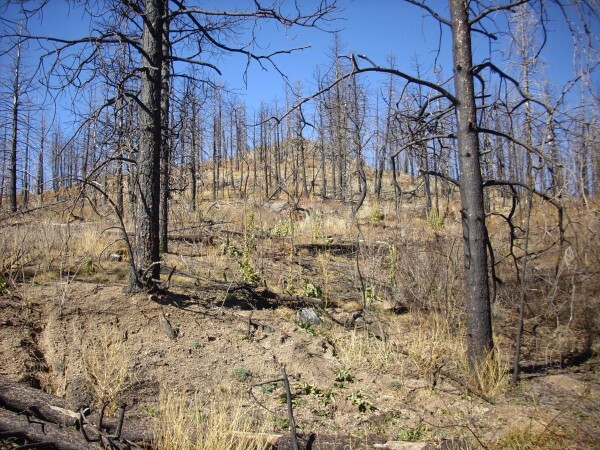 This area was swept by the 2011 Las Conchas fire. A very small silver lining to this very dark cloud is that the local geology is now stripped of its forest cover and easily viewed. This dome is part of the Paliza Canyon Formation, forming a little island sticking up above the ubiquitous Bandelier Tuff, composed of porphyritic hornblende dacite. Radioisotope dating of similar rock at a nearby exposure gives an age of 7.86 million years. The rock is very dark even though its silica content is not that low, due to its content of black hornblende. Here’s a sample. I hiked to the top of the dome, thinking it might be a good place for a panorama. Alas, there are enough burned trees still standing to block a clear view. Rabbit Hill is visible to the right in the first frame, while St. Peter’s Dome is centered in the second frame. The peak at the left of the third frame is Cerro Picacho, a plug of Bearhead Rhyolite. Mostly hidden behind trees in the center of the third frame is Cerro Balitas, which is also underlain by Bearhead Rhyolite. Cerro Balitas is reasonably accessible from the Dome Road, but Cerro Picacho is accessible only along the difficult St. Peter’s Dome Trail. I didn’t have time for either this trip. There is a low ridge extending west from Rabbit Hill, hard to make out in this photograph, that consists of various Paliza Canyon rock types along what appears to be a single fissure. This is unusual for the Jemez in that it trends east-west rather than north-south. Just past the unnamed dacite dome is a pullout. The pullout and the area around it are underlain by glowing avalanche deposits from Rabbit Mountain, over three miles to the northwest. Rabbit Mountain (which must not be confused with the Rabbit Hill mentioned earlier, which is east of this point) is a rhyolite dome 1.43 million years old, just the right age to be a ring fracture dome from the Toledo event that produced the Otowi Member of the Bandelier Tuff. 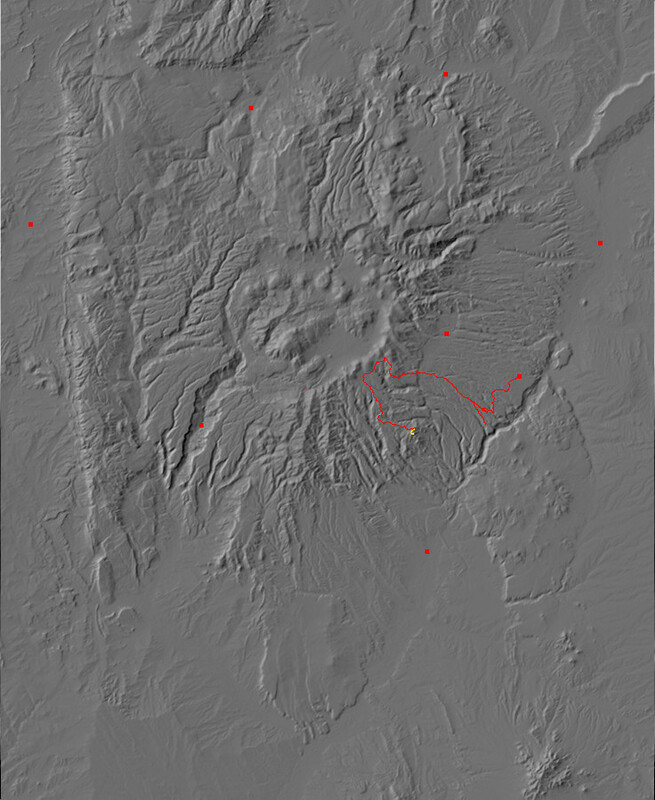 The presence of this dome on the south caldera wall was one of the clues that the Toledo caldera nearly coincided with the Valles caldera. Rabbit Mountain as it is seen today is probably only the southeastern part of the original dome, most of which collapsed into the Valles caldera when it formed. Active rhyolite domes tend to experience dome collapse, which sends an avalanche of red-hot rock and ash down the side of the dome onto the surrounding terrain. Such an avalanche occurred at least three times to the southeast of the dome, forming the deposits on which my Korean clown car is parked. The ground surface shows numerous clasts of rhyolite and obsidian. Here are samples of a couple of larger obsidian fragments. These chunks are about three inches long. The one on the left is nearly weapons grade, suitable for obsidian weapon tips. There is abundant archaeological evidence of widespread trade of Jemez obsidian throughout the Southwest. The fragment on the right shows flow banding. Further along the dome road, one gets a magnificent view of the San Miguel Mountains from the west. The foreground ridge in the first frame is underlain by Paliza Canyon Formation hornblende andesite and is part of the low ridge extending east to Rabbit Hill. The Sangre de Cristo Mountains are visible on the skyline across the boundary of the first and second frames. St. Peter’s Dome is centered in the second frame, with Cerro Picacho and Cerro Balitas to the right with Cochiti Reservoir between the two. In the far distance, left of Cerro Picacho, is Tetilla Peak in the Cerros del Rio south of White Rock. Sandia Crest is centered in the fourth frame on the skyline, while the south end of Peralta Ridge is visible at the center of the last frame. And one more panorama, this time to the west: Peralta Ridge. From here it’s on to St. Peter’s Dome itself. Taking the turnoff onto Forest Road 289, I head east. A warning to the wise: The main Dome Road is perfectly suitable for passenger vehicles in good weather. Forest Road 289 is another matter; it is quite rough in spots just east of the turnoff, and downright lousy close to the summit of St. Peter’s Dome. 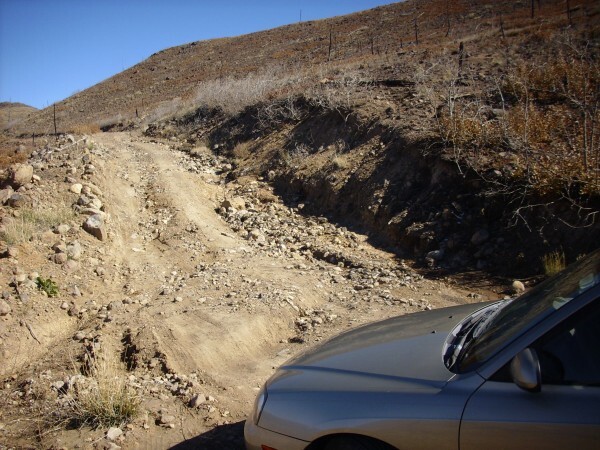 The first rough patch can be handled by passenger vehicles if you go very slowly. The rough spots on the peak … well, I made it, but I think I was being a touch foolhardy. It might be better to park there and walk. And then the road gets really bad. That’s my Korean clown car shivering in the foreground. “Nope, nope, nope. Not going any further.” Except this time I was foolhardy enough to force the passage. And bottomed out pretty badly; I’m probably lucky I didn’t puncture my oil pan or do other fatal mischief to my car. If you take a passenger vehicle this far, I really recommend hiking the rest of the way. It’s only about 1000 feet to the parking area, where you should probably stop anyway. Except I didn’t. Having got this far, and finding the gate unlocked, I drove another thousand feet to here. Where I finally decided my car had had enough asked of it. Nope. Not going to try to drive Clownie through that rock garden. I am shocked, shocked to find that my geologic maps disagree slightly on what to call this. It turns out that the San Miguel Mountains are located right where four corners of four quadrangles meet, which is quite a nuisance when visiting the area. Three of the maps map this as Tertiary volcaniclastics of the Paliza Canyon Formation. The fourth maps this as Quaternary sediments of the Cochiti Formation. It’s really a matter of semantics, I think. Either way, it’s rock eroded from the Paliza Canyon Formation. The Cochiti Formation is found throughout the southern Jemez and resembles the Puye Formation of the Pajarito Plateau. That’s the abandoned fire lookout on top of the summit. East of the summit is a wonderful place to take a panorama, if you don’t mind scrambling and aren’t bothered too much by heights. The first frame looks almost directly west, with Peralta Ridge on the skyline. Redondo Peak peeks over the nearer terrain left of center in the second frame. To its right is Rabbit Mountain, then Sawyer Dome. The remaining peaks of the Sierra de los Valles fill the third frame and part of the fourth frame. Clara Peak is visible on tbhe skyline in the center of the fourth frame. Boundary Peak dominates the foreground in the fifth frame, with beds underneath dipping to the west. One gains the impression that the center of the volcano lay east of the present summit and has been cut away by the Pajarito Fault, so that its remnants are buried under the Bandelier Tuff to the east. At the right edge of the sixth frame are red beds of the Gallisteo Formation, which is from from 15 to 30 million years in age. This older formation has been exposed by the extensive displacement on the Pajarito Fault. In effect, we are looking at a complete cross section of the San Miguel volcano on this side of the mountain. The seventh frame shows Tetilla Peak in the far distance and the southeast spur of St. Peter’s Dome in the foreground. Cochiti Reservoir is visible as well. The ninth frame is centered on Cerro Picacho and the eight on Cerro Balitas. Notice the cliffs on the east side of Cerro Picacho; if I read the geologic map correctly, these cliffs are formed from the Peralta Tuff of the Bearhead Rhyolite. This is the same unit that forms most of the tent rocks at Kasha-Katuwe Tent Rocks National Monument. Here’s a closer view of the Gallisteo Formation red beds. On the way down, I stopped to take a picture and a sample from the road cut just below the ranger station. Note the thin beds dipping to the west, presumably from a vent somewhere to the east. The rock here is a porphyritic andesite, with large phenocrysts of plagioclase feldspar. If you click to get the full resolution version of this picture, you can make out a bore hole on the boulder right of center where a geological sample was taken. This outcrop has been dated as 8.69 million years old. The San Miguel Mountains are an unusually interesting area from a geological perspective. I expect I’ll be making some more trips out here.